This chart reflects the results of a recent Gallup Poll -- done between February 1st and 10th of a random national sample of 1,044 adults, with a 4 point margin of error. Gallup asked respondents to name the one greatest enemy of the United States. 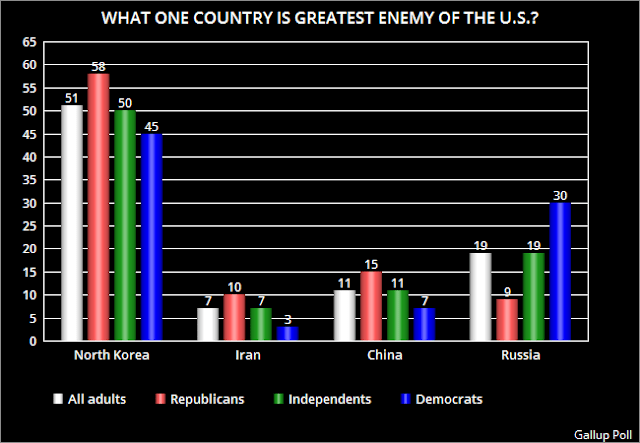 North Korea was named by 51% of Americans (including 58% of Republicans, 50% of Independents, and 45% of Democrats). It seems that the scare tactics of Donald Trump (and pushed by our media) over North Korea getting a nuclear bomb and perfecting a missile to deliver it, has scared a lot of Americans. Russia finished a distant second in the poll. I understand that fear of North Korea, but I don't agree with it. Yes, that country has a narcissistic blowhard as a leader (just like this country), but I don't think he's suicidal. He knows, just like other nuclear powers know, that sending a nuclear missile toward the United States would result in the utter destruction of his country. We have already proved that we will use nuclear power. There is another country that is a much greater threat -- Russia. Russia is the only country that has recently attacked us -- with cyber warfare. And they continue to attack us. Their attack has targeted our most precious democratic institution -- the fair and impartial election of our leaders. Their attack has divided us and cast doubt on our electoral system. They represent, by far, the biggest danger to this country. And neither Trump nor the Republican Congress is taking any action to stop or answer Russia's attack on the United States. To me, that approaches treasonous behavior.